So you need one, we agree. Now, how do you get one? So for really important documents, there are expensive “digital signature” solutions, but lawyers don’t need that kind of security for every day documents. Hell, even most pleadings and discovery documents require no more added security than you’d have with a signature stamp at your desk. But getting a legit-looking signature into electronic format hasn’t always been a very easy thing to do. And even if you manage to get an image of your signature that doesn’t have an annoying background to go with it, the was no true universal place to use it. Until now. Allow me to introduce your free electronic signature solution: Adobe Reader DC. 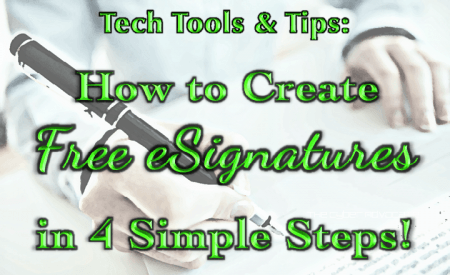 Here is how you can create an electronic signature to use on any PDF document that needs to be signed, without spending any money, and it takes about a minute to do. Adobe Reader DC on your computer (with or without a free account set up). 1: Take the plain white piece of paper, and sign your name. I strongly advise using a felt tipped pen, or even a permanent marker – you’re going to want those lines to be a little thicker. Otherwise your signature will look incredibly thin in the final version. So much so that it could actually lead people to question your new eSignature’s credibility – which is kind of the opposite of what we’re going for here. 2: Using your smartphone, take a picture and send it to your computer. This part isn’t hard, however works best for you. I prefer to email the photo to myself, then simply download the attachment from email. Make sure that you’ve gotten as close to the signature as possible, and I recommend turning on the flash – it prevents any shadows from accidentally becoming a part of your signature. Either sync your photos or email your eSignature image to yourself, and download it onto your computer. 3: Open Adobe Reader DC, and open up a document you need signed. f you havent set up a membership yet, you can do that now for free as well, but the signature will remain saved regardless. However, if you set up your free account, you’ll be able to log in and sign documents on different computers. Click on the Tools tab, and select Fill & Sign, and you will be prompted to open the document you want to sign. To set up your signature, it can be any PDF. Click on the image of the pen in the menu above the page, and you’ll be prompted to select either a script version of your signature, given the option to draw a signature or select an image. Pick the Select an Image option, and find the image you took with your phone. Your signature, with the background rendered transparent by Adobe, is now ready to be placed anywhere on the document you want. You’re also able to resize the signature as needed. Your signature will also be saved in Adobe Reader for future use, and – if you’ve followed my suggestion above and created an Adobe DC account – on any other computer you log into. You may prefer using a document that you’ve already signed and have a digital copy. Unfortunately, Adobe Reader is unlikely to remove the background and provide you with a transparent signature to add to your documents. Nothing says “suspicious” like a document that has portions of words covered by a white redaction box! No worries, though! Using Microsoft PowerPoint, you can easily create an eSignature with a transparent background. Just follow the tips in the video!